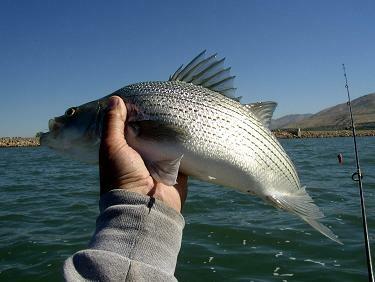 The Wiper is a hybrid cross between a male white bass and a female striped bass. Its appearance is intermediate between the two parents. It has six to eight dark horizontal stripes over a silver-white background with a dark charcoal to black back. It has two dorsal fins, the anterior with 8-10 sharp spines. It is slightly heavier bodied than the striped bass and grows up to 12 pounds in weight and 24 inches in length. Wipers are very aggressive fighters, and tend to stay	together in schools. Trolling is the most common technique used to catch them. Willard Bay offers some excellent Wiper fishing for most of the year, and in the late summer to fall the action can really heat up when the fish begin to "boil" on the surface when they herd schools of shad up to the surface, similar to what Striped Bass do at Lake Powell. Typically, the most common way to fish for Wipers is trolling lures such as "Producers", Rapalas or other crankbaits or spinners. They can also be caught with dead anchovies or other minnows, and occasionally the smaller ones are caught using worms fished for catfish.